With Elton John and James Taylor set to headline a TV Special in her honour, Joni Mitchell reflects on her far-reaching legacy. "I never wanted to be a star," Joni Mitchell says with a nervous laugh. "If anything, I've been trying to get out since I got in." It's a surprising remark, particularly delivered over lunch at one of the entertainment industry's posh watering holes, the Hotel Bel-air, near her Los Angeles home. But then, contradictions and confessions have always been coded into the DNA of the legendary singer-songwriter's creations. 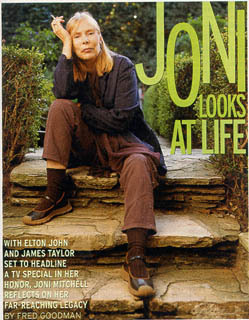 At 56, Mitchell is one of the most enduring musical icons of her generation - the author of such tie-dyed classics as "Woodstock", "The Circle Game" and "Big Yellow Taxi" - and artist whose musical impact will be showcased this month when TNT's Master's Series presents 'An All Star Tribute to Joni Mitchell', hosted by Ashely Judd. The Artist performing on the show, timed to the release of Mitchell's latest album "Both Sides Now", include Chaka Khan, James Taylor and Diana Krall. That such a diverse group would sing Mitchell's praises is no surprise. Wynona couldn't be more ardent. "She's my 'shero'. I've known her music since I was 10 - I can remember being in my room, grounded, and she was my escape. When I went to the Lilith Fair last summer, I thought, 'We're all just Joni Mitchell wannabes'"
Adds Tribute producer Monica Hardiman, "Elton John said, 'I will do anything for her - I must be in the show.'" And why not? After all, she is the only songwriter who can claim she named a president's daughter: Chelsea Clinton got her moniker from Mitchell's "Chelsea Morning." Born Roberta Joan Anderson to schoolteacher Myrtle and grocery chain manager Bill in Alberta, Canada, Mitchell got a sideways start on the road to being a rock and roll pioneer. A commercial artist by training and an unrepentant chain-smoker, she says she began playing folk music in art school just "to make money to smoke. I wrote poetry, but didn't want anyone to know I was an egghead - I was a party animal!" Signed by Reprise Records in 1967, Mitchell moved to L.A. just as California was reaching its musical and cultural heyday. She recalls, "A friend found an old book that said, 'Ask anyone in Hollywood where the craziest people live, and they'll tell you Laurel Canyon. Ask anyone in Laurel Canyon and they'll tell you Lookout Mountain (Avenue). So we went to Lookout Mountain." For Mitchell, who lived with Graham Nash in a bungalow that inspired his song Our House and who has also been linked romantically with David Crosby, James Taylor and Warren Beatty, those early days were golden. "When I moved (there)," she recalls, "there were no sidewalks, it smelled of eucalyptus and the air was filled with the sound of young bands practising." Mitchell had her first big success in 1968 when Judy Collins's version of her song "Both Sides Now," written when she was just 21, became a top 10 hit; it would take another six years before Mitchell achieved her own Top 10 single with "Help Me" from her breakthrough album "Court and Spark." With a career that now spans 33 years and 21 albums, she has proved adventurous, working with jazz and world music long before most contemporaries. Her most recent reinvention is as an interpreter of pop classics. Both Sides Now pairs her with and orchestra for smoky renditions of such standards as "Stormy Weather," as well as two of her own songs including the title track. Mitchell's private life has also come full circle: Three years ago she was reunited with Kilauren Gibb, the daughter put up for adoption 35 years ago and she is now a grandmother to Marlin, 7, and Daisy, 9 months. Indeed, Mitchell prepped for Both Sides Now by listening to recordings of female jazz singers at a Toronto bistro during the weeks she was waiting for her granddaughter to be born. Whatever trepidation Mitchell has about stardom, she admits looking forward to performing on her tribute show. 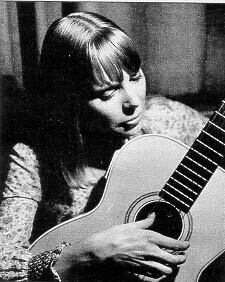 In fact, one of the most intriguing aspects of the special is that despite once being playfully described by David Crosby as "about as modest as Mussolini," Mitchell has generally turned her nose up at homage, as the Rock and Roll Hall of Fame discovered in 1997 when she snubbed her own induction. "If you're genuinely honoured, it humbles you," she says. "But when you're getting arrogant, those things begin to ring hollow." For Mitchell, who once again thinks of herself primarily as a painter, the show and an upcoming tour present a unique showcase. They're also sure to reawaken an old conflict: reaching a large audience versus maintaining privacy. After doing her best Ethel Merman imitation of "There's No Business Like Show Business," she says "I don't believe it (the lyrics). I'm not addicted to the roar of the crowd and don't understand why the show must go on." After a pause, she begins to sing "I did it my way." Mitchell is having a joke at her own expense but, as usual, mixes it with serious reflection. "I learned early that I couldn't trust anybody's judgement but my own," she says. Suddenly she brightens, the furrowed brow replaced by a playful toothy smile. "And even that only sometimes." Fred Goodman is the author of The Mansion on the Hill; Dylan, Young, Geffin, Springsteen, and the Head-on Collision of Rock and Commerce (Vintage Books). This article has been viewed 2,961 times since being added on January 16, 2001.